So…I think we all know, quintessentially, what St. Patrick’s Day dinner is supposed to look like. Corned beef and cabbage, however you may choose to cook and/or consume them, are the centerpiece of most March 17th tables (or at least those in parts of the country where everyone either really is of Irish descent, or everyone PRETENDS to be Irish so they’ll have an excuse to feel festive for no good reason). I’m certainly one to take part in the corned beef dinner most years, mainly because I like to make my own corned beef hash, and for that, I need leftovers. So even though I’m generally only lukewarm about the whole traditional meal, I feel like it’s the means to an end — one that makes me very happy when I sit down to my steaming plate of crispy hash and runny egg a few days later. Usually that’s as far as I take St. Patrick’s Day, and it’s fine; but this year, L. has taken a keen interest in wanting me to make “special” (a.k.a. cute — gulp) lunches for him on any given “holiday.” I’m really to blame for this, since I started the trend with a cute Christmas-themed lunch, followed it up with a Valentine’s Day lunch done all in pinks, reds, and heart shapes, and didn’t flinch or protest when he asked if I’d do one for St. Patrick’s Day. We decided together that I’d do both green food AND rainbows for him, since he didn’t think he could come up with enough green food ideas to make a lunch he’d love, and I, quite frankly, figured that rainbow food is MUCH easier than an all-green affair. But even though I’m going all technicolor tomorrow, I thought he’d still need a green entree. The simplest thing to do: Pull out the frog slime meatballs. For the uninitiated, “frog slime” meatballs are something I’ve made approximately forever. 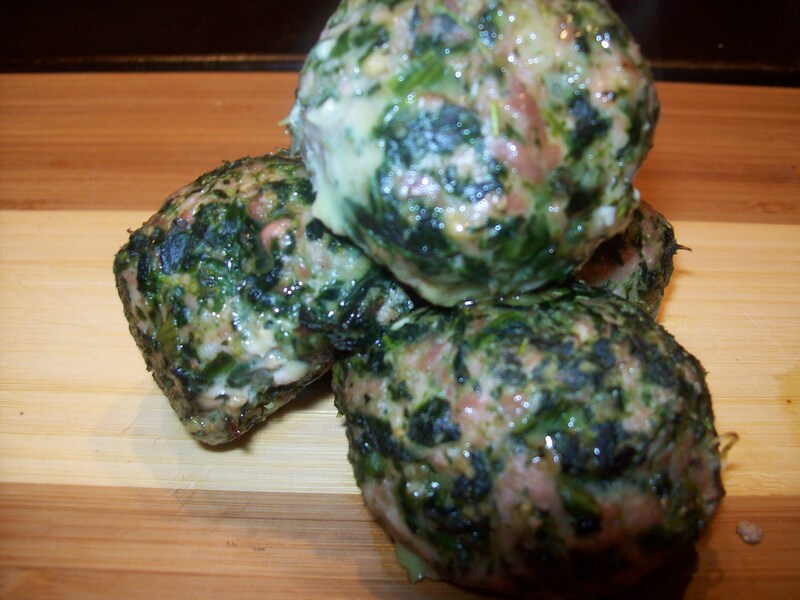 They’re just turkey meatballs (or mini-meatloaves, made in muffin tins) with a whole bunch of pureed spinach and basil in the mixture. Generally, they come out bright green. When L. was very small, he wouldn’t eat them unless we pretended they were made of something disgusting, so we told him the green was “frog slime.” His preschool teacher reported to us the next day that he had gleefully told all the other children that he was eating meatballs MADE OF FROGS. He has eaten the things ever since, quite happily, and P. has followed suit…as long as we maintain the amphibian ruse. The original recipe for frog slime meatballs, which I’ve printed here, calls for pureeing everything very well in a blender. I’ll admit I took a bit of a shortcut tonight — I used frozen spinach, which I had on hand, and didn’t puree it all smoothly, so the meatballs came out more like, well, meatballs with spinach in them than GREEN meatballs. But they’re still appropriately St. Patrick-y, I think, and the boys will still enjoy them tomorrow when they find them alongside their rainbow-colored accompaniments at lunchtime. For the heck of it, I thought I’d give you all a second recipe tonight, one that doesn’t by any means have to be for St. Patrick’s — but could be, for sure. 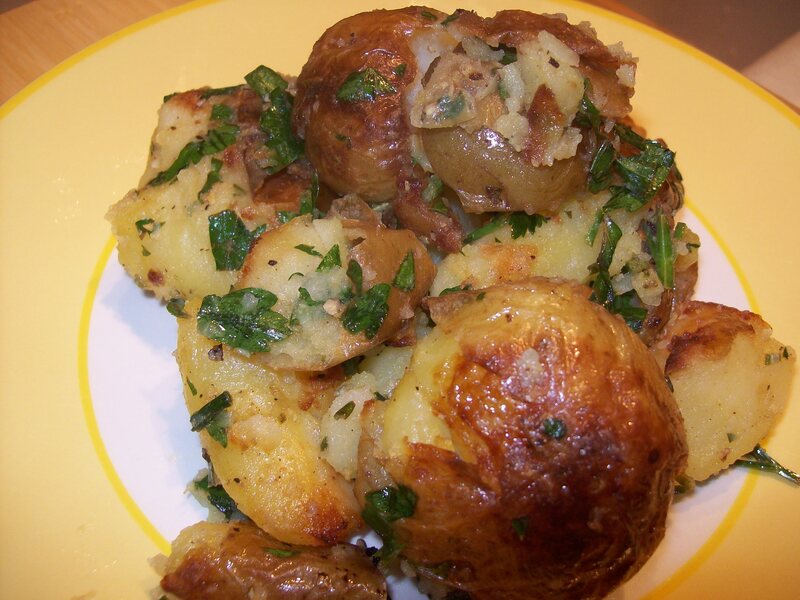 It’s a potato dish topped with vibrant green herbs, and it’s light and delicious. It would actually go nicely with the meatballs, now that I think of it, but it can be paired with just about anything. The crushed potatoes, crisped slightly in olive oil, soak up the flavors of lemon and herbs and become a lovely fresh, crunchy, creamy side dish. We particularly like them with fish, so if you want to be non-conformist this St. Patrick’s Day, cook up a bit of good salmon and serve crushed potatoes with it. Preheat your oven to 375 degrees. Grease 12 muffin tins with cooking spray. In a food processor, finely chop the garlic and onion. Add the spinach and pulse until very fine. Add the eggs, salt, and pepper, and pulse to mix. With the processor running, stream in the olive oil a little at a time until you have a smooth puree. In a large bowl, add the puree to the meat and mix thoroughly. Gradually add the breadcrumbs until you have a soft mixture that will just hold together (if you put a ball into the palm of your hand, it should sink a little — envision a shape like a scoop of ice cream). Scoop the mixture into the muffin tins and bake at 375 for 20 minutes. This entry was posted in Cooking, Feeding kids, Lunchbox, Meal planning, Parenting and tagged cooking, family, feeding kids, food, holidays, Household organization, kids' health, leftovers, lunchboxes, meal planning, parenting, recipes, school lunch. Bookmark the permalink.